If you were on the golf course last week you may have seen this machine working on the fairways. 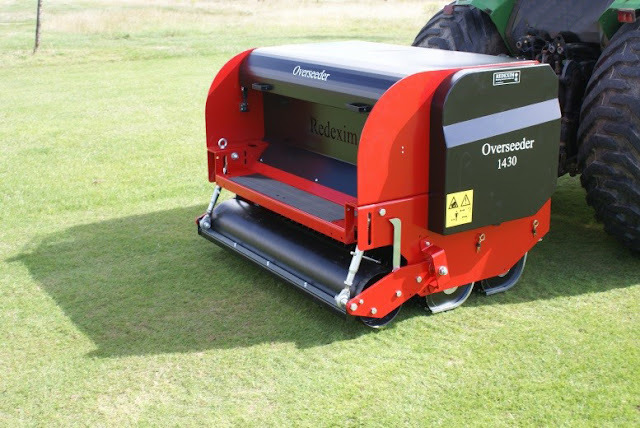 This machine is one of our newest acquisitions and what it does is slice into the turf and at the same time it drops seed into the slit created by many round knives. It's really quite remarkable and is a very effective interseeder. What is interseeding? Well it's when you plant seed into existing turf with the intent to supplement the sward with new grass plants. You could call this overseeding but it is very different from the process many refer to as overseeding when the intent is to have an entirely new stand of grass like in the example of overseeding dormant bermudagrass. When you see the beautiful fairways at Augusta National this week you'll be looking at overseeded bermudagrass. Here's a picture of what this machine did when we tried it on #2 fairway. As you know #2 is the most shaded fairway on the golf course, and because of excessive shade the turf there is simply not strong enough to handle the aggressive slicing nature of the machine. We only made one pass of the machine on #2 fairway. Here's what it should look like after using the new machine. You can see that there are slice marks but for the most part it is a very non disruptive machine and process. So why are we interseeding? Think of the fairway sward as a population. A population is stronger with more numbers and more diversity. When we introduce new young seedlings into the turf population we are increasing its strength. The new plants can increase the overall density of the sward and by introducing new species we can hopefully reduce disease severity, and improve drought or cold tolerance. So what grass species are we introducing with this new machine? Fescue of course. Chewings fescue to be exact. Golf was meant to be played on fescue. 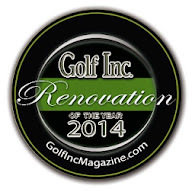 A fescue sward has the proper skid factor and firmness for golf. In addition, fescue is the native grass in our area and was the predominent grass species upon the prairies that once covered the Puget Sound region. Now don't get me wrong, we will never be able to convert the fairways to fescue with this machine, our goal is to have a mixed stand of grasses with fescue. Remember there is strength in having diversity so a mixed stand is the way to go. This will not happen over night and it will not happen at all if this process is not funded. We own the machine but buying enough seed to cover our 40 acres of fine turf will cost about $14,000 annually. In order to get the funding we need to see if it's going to work. The proof is in the pudding so we're interseeding a few fairways to see what happens. I'm not going to lie. This is pretty exciting for me. I can't wait to watch and see the results of this trial. Stay tuned.